The only time I have seen the Edmonton skyline has been on Hockey Night in Canada (HNIC). That was until I travelled to the University of Alberta/NiCHE 2012 Banff Environmental History Field Trip. I was so much more impressed with the in-person version. This does not have anything to do with the title of this piece except that 5 million is the number of visitors to Banff each year and that is 3 times the number of people who watched HNIC during the playoffs last year and almost as many who watched HNIC during Vancouver’s run in 2011. I was one of the 16 on this trip, and I’m sorry, but I miss hockey. However, this trip was even better than hockey. I could write about the visit to the Stoney Nakoda First Nation Reserve, or any of the many fascinating and informative stops, but instead I will focus on the non-human animals, the Cave and Basin historic site, and the Banff Park Museum. At the Parks Canada Wardens’ Office, we met Jesse Whittington. Jesse enlightened us on the wildlife corridors and how Parks Canada has been trying to accommodate non-human animals. 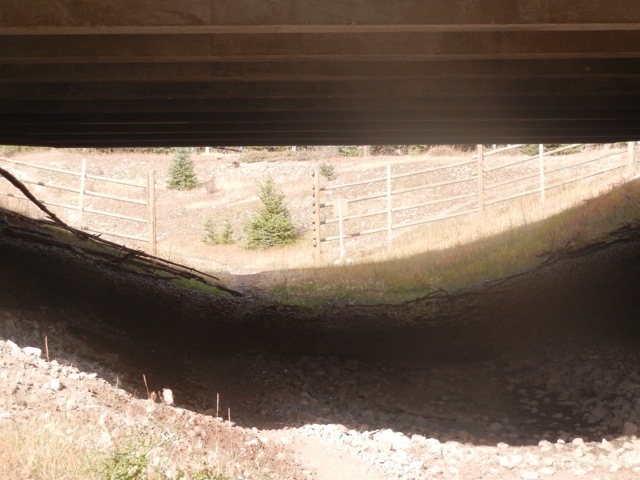 We saw up close an animal underpass, where different non-human animals pass under the highway. Jesse discussed how some predators and prey were using the underpasses as traps until both the animals and Parks Canada adapted to prevent this unintended consequence. Later, Ian MacLaren’s led an examination of a National Geographic guide to Banff and how the particularly white and affluent tourist experience, obviously hides the realities of Banff’s environmental and aboriginal histories. Yet, our discussion moved quickly to the film Bear 71. This film anthropomorphized a bear through a female narrator to present what a bear in Banff goes through. The film is interactive and allows you to see other animals in various activities in the Park. However, the “voice” of Bear 71 belies the realities of animal adaptation and evolution, including human animal interventions that we discussed with Jesse. This discussion really reinforced the multitude of ways humans have disrupted and interfered with the natural environment and how these always had unintended consequences. One of the interesting consequences is how non-human animals adapt to these disruptions, and that human reactions to these adaptations often continue the cycle of intervention. I brought up a Nature of Things episode on raccoons and how they evolve to be smarter at getting through the many new ways humans design to keep them out of garbage, garages, etc. Could bears and other Banff animals (including humans) evolve in similar but perhaps less pronounced ways? One way human animals are evolving in the area is at Cave and Basin. This was the birthplace of Parks Canada, and soon visitors to the area will have a state-of-art interpretive centre to examine the history of Parks Canada. This was also the site of interned Canadians during the First World War, and there is a smaller building at the back of the grounds to commemorate this. What I found interesting, and Steve Malins concurred, is that the physical layout of the built environment mimics the way a less pleasant aspect of Canadian history (like internment) is de-emphasized in the narrative. Yet, I was pleased to see that trained historians (Steve and Meg Stanley) were creating the displays at Cave and Basin and that there will be highly interactive exhibits for visitors to learn and have fun while doing it. According to Steve, the vision seems to be to return the space to its long-time use as a public space to be enjoyed both by residents and tourists. Of course, the function will be different, as the hot spring pool and baths will not be in operation, but perhaps there will be an outdoor skating rink and various events will be held there. Another incredible experience for me was the Banff Park Museum, a museum of a museum. What is a museum of a museum? Well, it is a museum that has changed very little since its inception. 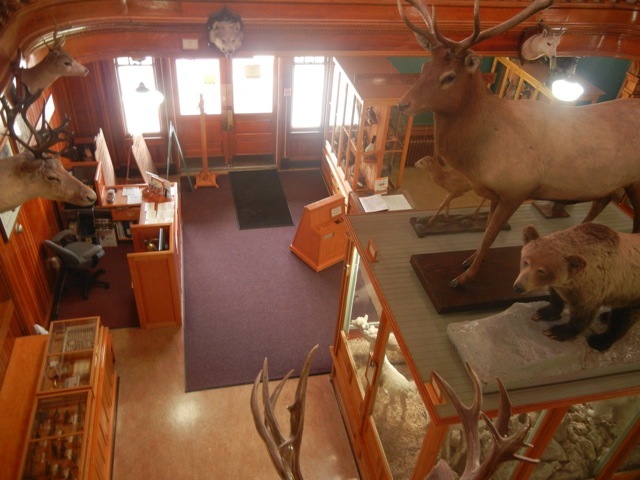 The display cases and the taxidermic animals were straight out of the 1930s. Being able to experience a museum almost exactly as someone from 1940 was amazing. The unfortunate part was that it was closed to the public and Parks Canada has been told it will only be permitted to open during the summer. Worse, there will not be any staff, as visitors will follow a self-guided tour. Within these constraints, Steve is looking at non-obtrusive ways to bring the museum into our digital world. By installing QR codes, visitors could transform their experience into a digital version of what curating the museum was like for the creators, and these digital versions could have representations (like historical re-enactments) of those people involved. This is one way the museum of the museum can remain relevant into the future, but like the digitization of archives, this does not solve the problem of cost-cutting affecting operation and staffing. The main problem is that many people will not get the concept of a museum of a museum without a person informing them as soon as they come in. A last highlight of the trip for me was the tour of the Whyte grounds and Abegweit House. Almost all of the 16 of us lobbied to support many Whyte Foundation staff’s hope that these residences be turned into accommodation for visiting researchers. All I could think about was trying to come up with a project to take advantage of this as soon as they are ready for me to again be one of the 5 million.